SACRAMENTO, CA: When AB 1634, the so-called California Healthy Pets Act, passed the California Assembly on June 6, it was the most controversial bill of the year ― and therein lies a mystery. What motivated lawmakers to pass such a flawed and contentious bill? Perhaps they believed that voting for it would actually reduce euthanasia in California shelters. Or maybe they bought the sponsors' arguments that even if lawmakers don't care about pet issues, they should vote for it to save taxpayers' money. Equally mystifying is the bill's ideological pedigree: how could the "party of choice" force Californians to submit their pets to major surgery? The list of questions is endless, but the fundamental answer is this: In media, politics and fundraising, animal issues are the "Great American Goldmine." Everybody loves animals, but few urban Americans really know much about them. That makes animal issues a prime target for misunderstanding and exploitation. The result: sensational front page stories and photos, political platforms, and axe-grinding activists are left to fill in the void with their own opinions and versions of reality. Regrettably, many Americans, including lawmakers, get their education about animals from groups that put emotion, fundraising and political agendas above factual accuracy ― above responsible political process ― and for that matter, above animal welfare. During the review of AB 1634 in the California Assembly, assembly members were inundated with information, misinformation, emotional pleas and political pressure from all sides, but they did not have the facts they needed to make a well-reasoned decision. In the following article we will use graphs to present the facts and provide links and new information to shed light on the various pressure groups' biases. Proponents of the bill claim that money motivates pet owners and breeders who oppose AB 1634. Opponent groups, including NAIA, disagree with that assertion, and oppose AB 1634 because the arguments marshaled in favor of it are provably false; because it could easily reverse the positive animal welfare trends that are currently underway; and because the bill's ideological roots push an agenda that is not in the best interest of animals, the economy or our society. 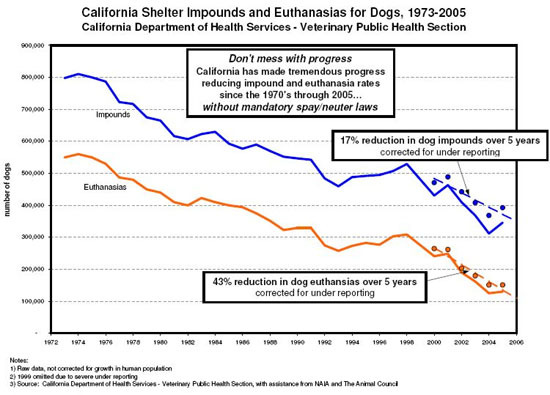 The proponents say that AB 1634 is needed to reduce shelter impound and euthanasia rates, but the following chart shows that dog rates have declined dramatically in recent decades as dog owners have recognized the need to train, confine and properly care for their dogs, and as access to pet owner education and low cost spay/neuter clinics has increased. As a direct result of successful voluntary approaches, the number of dogs available for sale or adoption has plummeted so sharply in recent years that at least 10 thousand dogs (mostly puppies) are now smuggled into California annually from Mexico to meet the demand. A universal problem, as indicated in the 2007 Los Angeles Animal Services Annual Report (p 17) is the burgeoning population of free-roaming, feral (wild) cats. Although no agency has precise feral cat shelter data, shelter personnel estimate social cats (ones that accept human touch) at no more than 35% of the total impounds. About 65% of shelter animals today are cats, and most are feral. By definition, feral cats have no owners, so AB 1634 will have little, if any, effect on the problem. 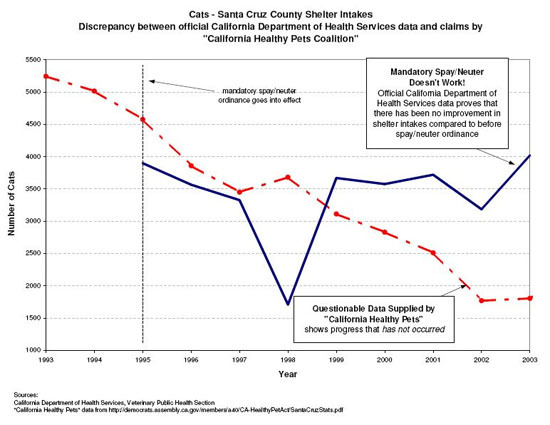 Proponents of AB 1634 use Santa Cruz County, which passed a mandatory spay/neuter law in 1995, as a poster child for the bill, claiming that the Santa Cruz policy led to great reductions in shelter impounds and deaths. But the Santa Cruz data presented by the proponents of the bill differ sharply from the data submitted by Santa Cruz County to the California Department of Health Services, as required by state law. The following graphs show the differences and underscore the gravity of relying on such unsettled evidence to support a new state law. Graphs based on countywide data reported to the state also show that Santa Cruz is not doing as well as surrounding counties, which do not have Draconian laws in place. 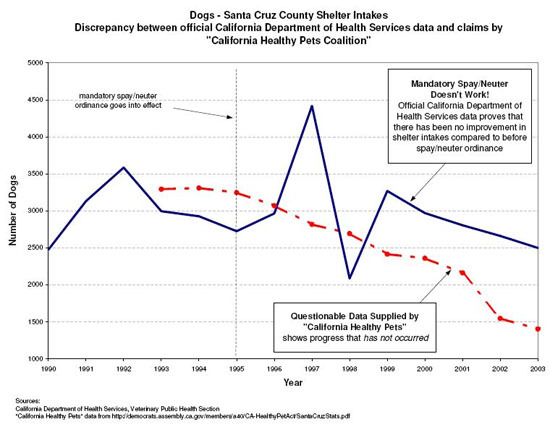 Notwithstanding the discrepancies between the Santa Cruz data submitted by the California Healthy Pets Coalition and the state-mandated data, proponents claim success in Santa Cruz anyway, saying that the cities and unincorporated areas within Santa Cruz County that adopted their ordinance outperformed the cities within the county that did not. This is not a credible position. 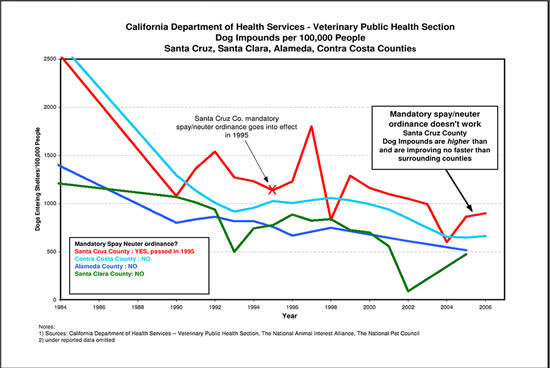 Moreover, the graph supplied by the California Healthy Pets Coalition uses data in both pre- and post-ordinance years that are inexplicably higher than the countywide data reported to the state. This raises questions of data quality and source because in recent years, the graph claims to use shelter data only from the areas that adopted the ordinance not from the entire county. At best this produces an apples to oranges comparison. At worst, it suggests manipulation of the data. The fact is, history shows that mandatory spay/neuter laws have never worked. They lead to increased pet abandonment and shelter deaths, as well as other unintended consequences. That's why Peninsula Humane Society, the organization that introduced the nation's first mandatory spay/neuter ordinance in neighboring San Mateo County reports that PHS won't be supporting AB 1634. Like other jurisdictions, they have, through trial and error, found that other programs simply work better. 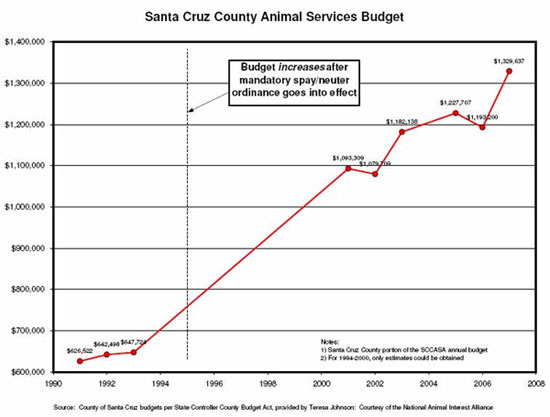 The proponents say that passing AB 1634 will save California taxpayers at least $250 million in animal control costs, but since passing its mandatory spay/neuter bill, Santa Cruz County expenditures for animal services have nearly doubled. On the other hand, if AB 1634 proponents prevail, California's economy stands to lose at least $100 million in tourism dollars each year if dog and cat events follow through with their vow to boycott the state. Even more harmful to California's economy would be the loss of volunteers from clubs and associations like the American Kennel Club ( AKC ) and Cat Fanciers Association (CFA). Members of these nonprofit associations promote responsible pet ownership every day. They help pet owners train their dogs; fund veterinary scholarships and canine and feline research; support service dogs, and search and rescue programs; host microchip clinics and provide myriad pet-related services to the public at no cost. Without these thousands of volunteers, California would have to fund these services on its own. The dedicated dog and cat enthusiasts who are being targeted by AB 1634 should be considered assets by California lawmakers, and utilized in addressing future animal welfare problems. They are the solution, not the problem. Finally, even the bill's name is misleading. California Healthy Pets Act implies that it will improve the health of pets, but many veterinarians oppose spaying or neutering pets as early as this bill requires. Other veterinarians who support early spay/neuter in general, still oppose AB 1634 because it interferes with their ability to treat individual patients according to their individual needs. Peer reviewed studies cite increased risks of certain kinds of cancer, orthopedic problems, incontinence, hypothyroidism, obesity, infections and adverse reactions to vaccinations, especially when sterilization is performed too early. In any case this is a decision that should remain with pet owners working in consultation with their veterinarian. It should not be mandated by government. These facts make the politics behind AB 1634 all the more confounding. AB 1634's passage was almost a straight party-line vote. Not one Republican voted for it. Just six Democrats voted against it. In the end, it passed due to last-minute arm-twisting by Democratic Party leaders and a torrent of lobbying phone calls by at least one high-profile celebrity, animal rights activist and TV personality Bob Barker. Close examination reveals this legislation to be, at best, an ill-conceived mismatch between means and ends. At worst, AB 1634 represents a deeply troubling step toward state micromanagement and taxation of pet ownership, a situation that leads some Californians to call AB 1634 "the Pet Extinction Act." Yet AB 1634 isn't simply a well-meaning but spectacularly ill-conceived bill. This legislation has the fingerprints of radical animal rights ideology all over it. The bill's chief advocates claim they have no relationship to animal extremists. But People for the Ethical Treatment of Animals (PETA) operatives play key roles in Social Compassion, a sister group to the bill's public supporter, CA Healthy Pets Coalition. More recently, a self-proclaimed PETA representative has started running phone banks to lobby for the bill. It may also be helpful to realize that AB 1634 had its genesis in the Green Party – not an extremist group itself, but one whose political platform and supporters have much in common with the animal rights agenda. AB 1634's central provision of mandatory spay/neuter is straight out of an animal liberation plant of the Green party platform, which animal owners have renamed the animal rights agenda,. Breeding purebred dogs and cats has been discouraged for many years, (a goal shared by PETA). In addition, AB 1634's language was drafted, at least in part, by a prominent Green Party Member: Dr. Alan Drusys (a veterinarian at Riverside County shelters). Drusys assisted Judie Mancuso in drafting AB 1634, which he says is based on his own Riverside ordinance proposal (which has not yet been approved.) Judie Mancuso, of course, is the person behind the CA Healthy Pets Coalition. Drusys' Riverside County Department of Animal Services is a coalition member. Finally, AB 1634 enjoys support by five key, mainstream members of Los Angeles' elected power structure. But this fact must be seen in the context of animal rights violence — and its dramatic impact on LA city personnel and policy. "In order to understand the dynamics of this insane bill," says NAIA national director Patti Strand, "you need to be aware that Los Angeles Animal Services (LAAS) and city politicians have been under siege by animal rights extremists for many years." It is no coincidence, then, that the bill's most powerful and influential proponents are all LA- based: LA Mayor Antonio Villaraigosa; Ed Boks, general manager of LA Animal Services; and the bill's authors, Lloyd Levine in the assembly and Alex Padilla in the senate; and the powerful Speaker of the Assembly, Fabian Nunez, are all from Greater Los Angeles. Over the last several years, vicious and criminal animal rights extremists have driven one LA official after another off the job through intimidation, defamation and terror. Everyone wants to reduce the number of animals euthanized in animal shelters, but while the true animal welfare groups, many of whom are against this bill, work through legal and ethical means to provide low-cost spay/neuter clinics and promote responsible pet ownership, the radicals push coercive and even terrorist means to achieve their agenda. In September 2005, the Animal Liberation Front (ALF) blew up munitions-grade smoke grenades in the apartment building of LA Animal Services Director Guerdon Stuckey. Between January 2004 and December 2005, Animal Defense League (ADL) members left obscenities and other messages on the home answering machine of LAAS director of field operations David Diliberto, including "Resign or we go after your wife." ALF or ADL members dressed as mortuary workers showed up at 3 am at city animal control officers' residences, asking "Where's the body?" These types of home visits caused Stuckey's predecessor, Jerry Greenwald, to resign after the relentless pressure gave his wife a heart attack. According to LA's city attorney, ADL and ALF campaigns have included trespassing, vandalism, violating noise ordinances, intimidating the child of a public employee, making illegal threats, and more. Murder and assassination have been explicitly endorsed as an animal rights tactic in US Senate testimony by Jerry Vlasak, MD, radical spokesperson for the LA-based Animal Defense League. Vlasak puts forth his "no kill" credo toward LAAS personnel this way: "If someone is killing, on a regular basis, thousands of animals, and if that person can only be stopped in one way by the use of violence, then it is certainly a morally justifiable solution." The Stop the Killing website currently depicts Mr. Boks as Himmler, presiding over 6 death camps and brags about the 16 LA employees, managers and elected officials they have successfully eliminated. They even claim the previous LA mayor, Jim Hahn, as one of their trophies. This sort of activism is uncharted territory for politicians. Few, if any, know how to counter the thuggish tactics of a movement that employs legal and illegal tactics and operatives, and markets its goals to the public in mom and apple pie fashion while skillfully using the US constitution to protect the whole of its operation, legal and illegal. So, when running for mayor of LA, Villaraigosa made animal activists a campaign promise that if elected, he'd hire a new general manager who could achieve their goal of making LA a "no kill" city. But now, after giving LAAS a brief honeymoon, the radicals are targeting Ed Boks, the general manager Mayor Villaraigosa appointed to fulfill that promise. So activist thugs are once again on their game — going after Boks personally and his shelter volunteers; employing the usual mix of intimidation, threats, vandalism, and online defamation campaigns. The FBI classifies animal rights extremists among America's most dangerous domestic terrorists. The Bureau points out that animal rights activists share a common ideology, with activists choosing a mix of legal and illegal, and even terrorist tactics to achieve their common goals. According to Strand, "The brass knuckles wing of the AR movement practices bomb-throwing, physical intimidation and extortion, while activists operating above ground promote legislation, litigation, and at the same time provide marketing cover and political support for targeted election and legislative campaigns. Operating in this multi-layered fashion gives them tremendous leverage for getting their way." This may be why LA's methods of dealing with animal extremism appear schizophrenic at times. For instance, the day after Mayor Villaraigosa fulfilled his campaign pledge to the LA animal activists by firing shelter director Guerdon Stuckey and installing Ed Boks, the mayor attended a press conference in which the city attorney brought charges against activists for their violent and illegal intimidation tactics. And, while the city of LA is insisting that AB 1634 is crucial to solving "the problem," and while LA is a prominent member of the California Healthy Pets Coalition (the only major California city to join), it is simultaneously reporting unprecedented success in reducing LAAS shelter deaths — a result that would seem to counter the need for a mandatory spay/neuter bill such as AB 1634. Whether or not it's possible for politicians to barter cover from this increasingly influential and lawless movement is doubtful. But for any elected official who can follow the money (not to mention the trail of explosive devices and resignations), supporting a well-packaged but nonetheless radical animal bill may appear to be the lesser of two evils. So we're back where we began, with an unraveling mystery. Does pressure from extremist animal rights groups lie at the root of AB 1634? The answer is an emphatic "Yes!" Nothing else could explain why the "party of choice" is so willing to force major surgery on their citizens' pets or why they have so far accepted the flawed arguments presented in favor of the bill. With this in mind, NAIA calls on Californians to reject this nightmare of a bill. At stake are the freedoms of California pet owners who account for more than 63% of the population; the health of millions of California pets; and of enormous importance, too, the fundamental health and integrity of the California political and legislative system. We urge our members throughout the US, but especially in the LA area, to get involved with local governments and animal control agencies. Help officials overcome the extremist fringe that increasingly dominates animal issues and the political process nationwide. If animal experts who not only love animals, but also believe in the rule of law, don't get involved, who will be able to stop this doctrinaire, unethical and illegal movement from taking over? Government officials cannot successfully oppose this particular form of extremism without the benefit of our knowledge and thoughtful participation. Together we can work for genuine improvements in animal welfare, not only in the Golden State, but throughout the country. Meanwhile, Californians need to defeat AB 1634! We simply cannot allow animal rights extremists to dictate California's animal welfare laws.